John Bonk was born August 27th, 1950 in Hamilton, Ontario and attended Delta Secondary School. In 1970 and 1971, while attending Mohawk College, he continued playing football with the Burlington Braves of the Canadian Junior Football League (CJFL). Bonk’s pro-football career began when the Hamilton Tiger-Cats invited him to training camp in 1972. Although most of his play that first season was with their developmental team in Kitchener, he played every game at linebacker in the 1973 season until he was traded to Winnipeg. 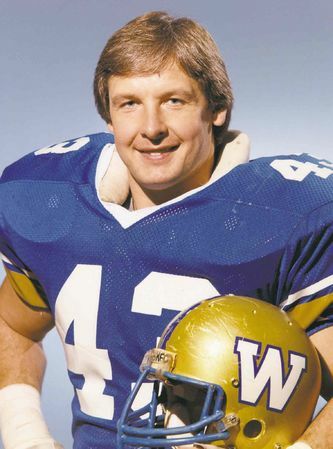 Bonk started at linebacker in Winnipeg, but switched to centre, the position he played for the rest of his career. He did not miss a regular season game between 1973 and 1985 (202 games), when a neck injury sidelined him and eventually led him to retire from football following the 1985 season.